28/08/15. Shaqlawa, Iraq. 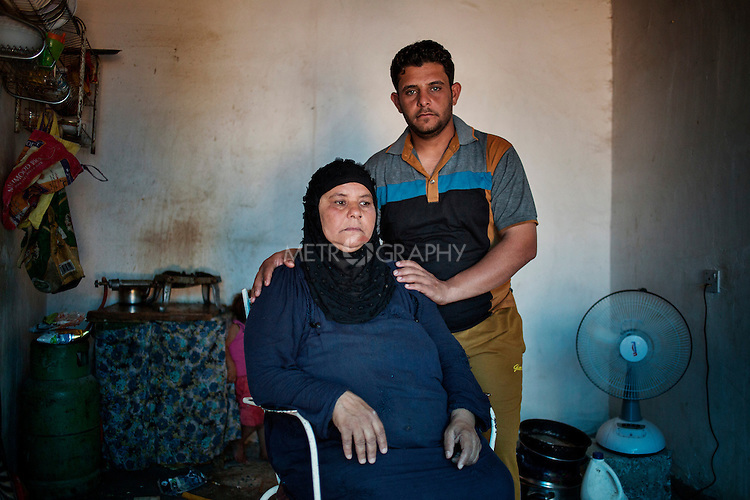 -- A portrait of Fawziya and her youngest son (24) Mohamed, displaced from Falluja. Fawziya does not remember if she is 45 or 46. She has been living in Shaqlawa with her two sons and their families for the past 7 months. They left Falluja after that one day a bomb hit and destroyed their house killing Fawziya's daughter. In Shaqlawa they are renting two small concrete shacks, for which they pay 400 usd. Copyright: © Dario Bosio / Metrography all rights reserved.